We are now more than 10 years past the height of the shortstop renaissance. In 1999, it seemed like shortstops ruled the American League. Two of them, Nomar Garciaparra and Derek Jeter, finished among the top 5 in the AL in wOBA, with .436 and .428 marks. Alex Rodriguez was right behind at .397, and even Omar Vizquel broke out the hitting shoes that year and produced a .379 wOBA. Royce Clayton was the fifth best-hitting AL shortstop that year with a .344 wOBA. Even without the top-heaviness, AL shortstops remained a productive bunch. In most years they have five or six with wOBAs above .340. In 2007 that was the case, as five hit the .340 mark. The difference was that the leader, Jeter, produced a .369 wOBA, far down from the top end of years past. 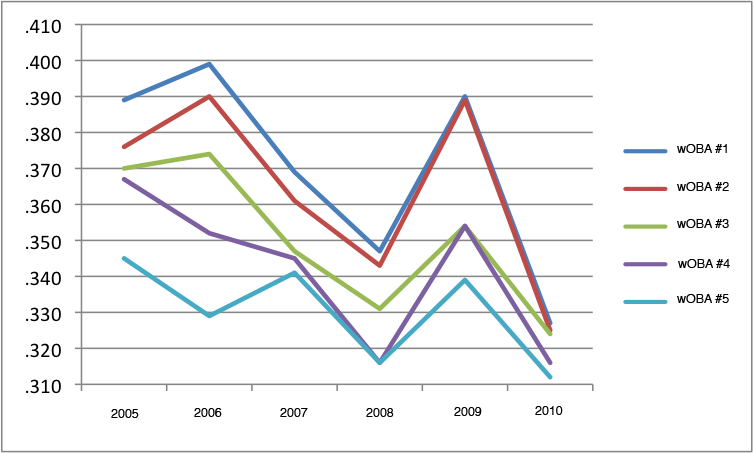 In 2008, AL shortstop was even further down. 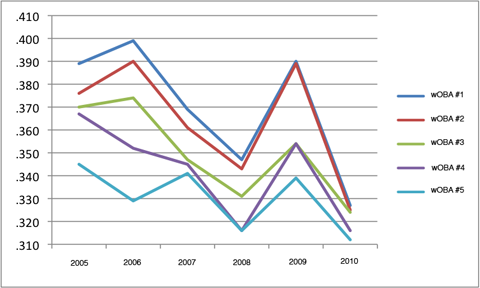 In 2009, it recovered a bit, mainly because of superb season from Jeter and Jason Bartlett, but in 2010 it is down again. It is, in fact, lower than it has been in more than two decades. You can see the top end tumble precipitously from 2006 through 2008, with a quick spike in 2009 and then back to the normal decline. Chances are we’re not going to see a significant uptick any time soon. The guys who topped this list either don’t play the position any more (Michael Young, Guillen, Jhonny Peralta), are aging (Jeter), or both (Tejada). Since there doesn’t seem to be any upcoming AL shortstops with big-time power potential, and since teams have placed an emphasis on defense, chances are we’ve seen the era of the shortstop come to a close, though maybe it’s more like a temporary halt. Thankfully, shortstops need not hit like right fielders to provide value to their teams. Defense plays a big part in evaluating a shortstop. The quirk in this is that while AL shortstops are producing at a lower offensive level, they also seem to be producing a bit less in terms of UZR defense. That is the topic for another article, though. We hoped you liked reading What Happened to the AL Shortstops? by Joe Pawlikowski! Yuniesky Betancourt is a league-average SS bat this season. You could’ve made the entire article that sentence and it would have been just as effective.